Like lawn darts, nano-magnets, and slap bracelets, fidget spinners are only one stupid stunt away from becoming yet another forgotten fad. And as usual, instead of enjoying them responsibly, the internet is hard at work trying to find ways to make spinners as dangerous as playing with firecrackers. This is why we can’t have fun things. It goes without saying, but we’re going to say it anyways: Please don’t try any of these experiments at home. There’s enough people out there trying to hurt themselves with fidget spinners. Revving a fidget spinner up to thousands of RPMs while it’s grasped firmly between someone’s fingers already seems dangerous enough. But add a pair of incredibly powerful magnets to the mix, and suddenly you’ve got a hovering fidget spinner that’s a few RPMs away from breaking free and flying across the room in search of a victim. In the wrong hands, any object can be potentially dangerous. Like the hands of Joerg Sprave, who’s found a way to weaponize everything from Lego bricks, to Nerf darts, and now even fidget spinners with a custom slingshot blaster that launches them with enough power to make you wish you weren’t in his crosshairs before he pulls the trigger. Popcorn, a microwave’s closest ally, can barely survive spending a few minutes in your futuristic oven. So what are the odds a fidget spinner will survive? Slim. This one wasn’t completely destroyed, but the bearings that actually make it spin, its sole raison d’être, were totally nuked. 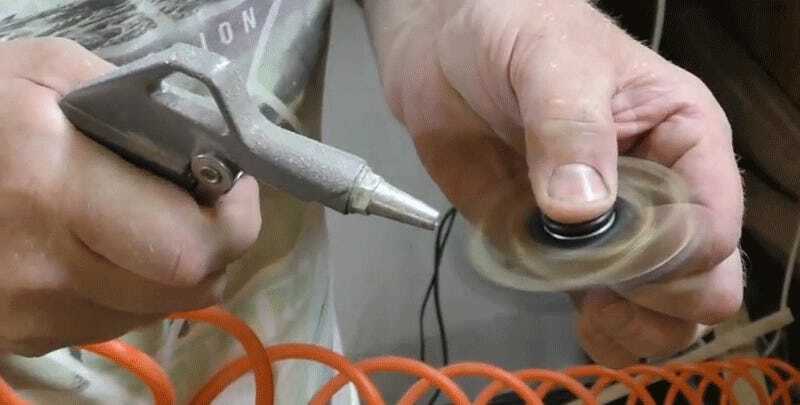 Using a steady blast of compressed air, you can get a fidget spinner up to over 10,000 RPMs so that it sounds like a jet engine ready to take off. But should you be holding it during a stunt like that? Not if you like having five fingers on each hand. On multiple occasions Tony Hawk has landed his famous 900 trick, which is a full two-and-a-half rotations in the air after launching off the top of a half pipe. But there is little chance you could convince him to drop into a bowl on a deck with fidget spinners replacing its wheels. Jumping onto soft pillows is fun, jumping onto fidget spinners—made of hard plastic surrounding a steel bearing—is not. Even adding a trampoline to the mix isn’t going to soften the landing, but at least you’ll have some amazing bruises the next morning. The internet is chock full of terrible ideas, and using a chainsaw to get a fidget spinner spinning certainly ranks among the worst. Losing a finger is the least terrible thing that could result from an experiment like this. Waffle irons have brought nothing but joy and deliciousness to mankind. So aside from the risks of breathing in the toxic fumes of melting cheap plastic fidget spinners, deliberately destroying a waffle iron in the process, for the sake of clickbait science, might be the worst part of this experiment. Actually, this one is fine. By now every corner store, bodega, and gas station in the country has a counter stocked with fidget spinners. Flattening one to a pulp with a giant hydraulic press is a drop in the bucket, but an important first step towards putting an end to this annoying fad.